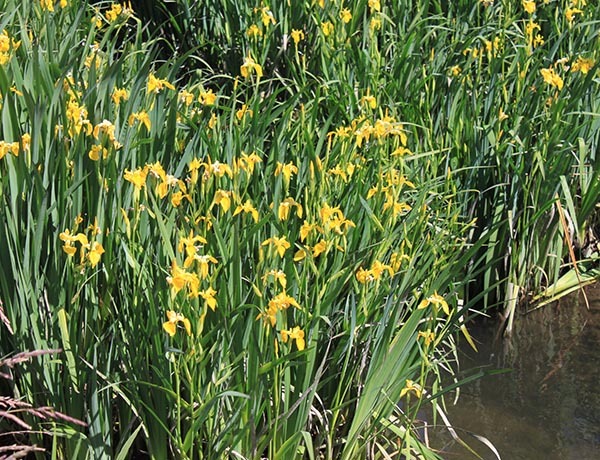 General Description:Yellow flag iris is a perennial, aquatic, herbaceous plant which grows 2 to 3 feet tall along shores in shallow water. Rhizomes spread and form large clumps. Flower Description: Flowers few to several near stem ends. Flowers pale to dark yellow with brownish purple mottled markings. Flowers have 3 sepals and 3 petals, with petals shorter than sepals. Leaf Description: Stem and basal leaves present. Basal leaves are broad, flat, sword-shaped and stalkless. Stem leaves reduce in size going up the stem. Stem Description: Stems branched once and solid. Fruit/Seed Description: Capsules form from flowers, somewhat 3 angled and filled with flattened, D-shaped seeds. Yellow flag iris is an invasive ornamental perennial that is a problem in many states and other countries. It will sicken livestock if ingested and is generally avoided by herbivores. Contact with its resins can cause skin irritation in humans.